This is beginning to look like a theme! Regular followers will be aware that both Monday’s post, The growth of empathy, and Tuesday’s post, Questions without answers, had a common theme. That of “the rising consciousness of all the millions of ordinary people just trying to leave the world in a better place”, as I wrote on Monday, in contrast, even stark contrast, with the blindness, for want of a stronger term, of those charged with governing our societies. 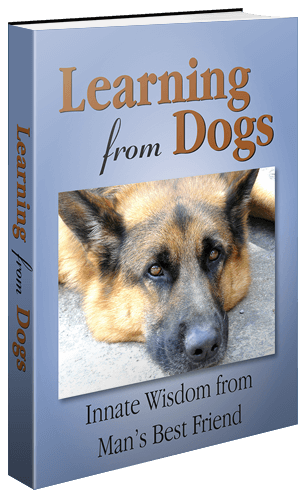 dcardiff just started following you at http://learningfromdogs.com. They will receive an email every time you publish a post. Congratulations. Like many other bloggers I try and go to whatever blog site that follower has and leave a ‘thank you’ message. So off I went to Gotta Find a Home. The blogsite is by Dennis Cardiff and the sub-title of the blog is The plight of the homeless. Craig, slept on the sidewalk in the freezing cold. I see him every morning and am never sure if, when I lift the corner of his sleeping bag, I will find him dead or alive. Sometimes, he confided, he would prefer never to awake. Not only does that stir one’s heart and conscience but more so the fact that there are 6,069 followers of Dennis’s blog. 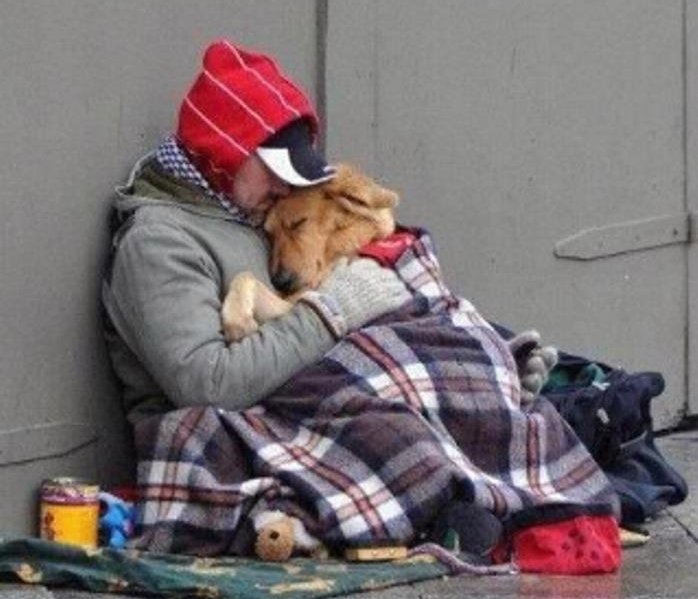 Reflect on how when you see a homeless person with so little, how so often they have a dog. To close, let me tell you more about the photograph. I saw it on the blogsite Erick’s Odyssey in the following post. A friend of mine posted this photo on their Facebook wall. Like most people when they first see it, I was overwhelmed with several emotions. First of all, I felt a swell of compassion for these two. I don’t even know them, but I was immediately concerned with their wellbeing. I wanted them to be warm and fed, and protected. Secondly, I was touched with the apparent love and friendship shared by the two, even though they are not even of the same species. I thought, “They may have nothing, but they have each other, so they have everything.” I don’t know by what circumstance this man and this dog came to be together, living on the streets, but I think it is a reflection of the callousness of our society. Whatever the reason they are homeless, they are an opportunity for us, those who have the necessities of life in abundance, to show kindness and compassion. Remember this the next time you drive by a similar scene in your warm car. Remember that if you were in their shoes, you would want, or even if you would be too ashamed to ‘want,’ you would ‘need’ someone to help you. Our apathy is what makes us truly destitute. Yet another example of the power of this new world of interconnectedness and how, ultimately, those connections between all those millions who care will bring about a new caring era! This is such a touching post. That picture with the dog – God bless them both. My heart is so full of sorrow at homelessness. Thanks for the comment. There does seem to be quite high levels of homelessness in these parts. Maybe because it’s’easier’ to live, sorry survive, in the forest. In my eyes, dogs are my best friends! What an impressive photo. No words! Unfortunately, it takes a certain amount of ruthlessness (and in the US in particular money) to achieve high-enough office to be in a position to really influence things for the good on a national or international level. Nice, caring, selfless, educated and concerned people seem to me less likely to have as much money and ruthlessness as those who actually do achieve power. Therefore, the former group of people are under-represented in government. Doing something about this is another matter. Concerning the tramp and the dog, whenever you see a Western tramp (other beggars almost never have dogs) on the streets (majoritarily male by far) they invariably have a dog with them. One’s first reaction is: “How the hell can they afford a dog when they are begging for food?” But of course, having read Paul’s post it is clear that the dog and its food probably have a higher priority for the tramp than his own well-being, and for the reasons Paul mentions. Chris, lovely to have your comments. When I read the post out to Jeannie yesterday evening, as I always do, she dissolved into tears over the photograph. We chatted. Both admitted to not knowing what to do when we see homeless people. As we do most times when we go out. Then, thanks to Dennis above, we realised that all we need to do is to carry food in the car, for both the person and their dog. What a clever idea, and so easy – just needing a modicum of care and thought. Not sure if it would work here in Germany (never seen anyone else do it!) but someone has to be the first to start a trend. Maybe l’ll give it a try! This is a powerful blog post. Having been camping in the wild during a sudden wintery spell of weather I gained a glimpse of what a homeless person could face. Thanks Alex. The difference being, of course, you could come home!